• Enhance the environmental quality. Improv­ing and maintaining individual buildings cu­mulatively enhances the overall quality of the downtown environment. The quality of the individual stores in a downtown is very im­portant but the overall environment should attract people to the district. The downtown should be perceived as a district that people want to spend time in both shopping and ex­ploring. • Improve the economic potential. Heritage tourism and the attraction of unique com­mercial districts are becoming more and more attractive to local and regional mar­kets. Establishing a quality environment will attract both visitors and new businesses. Auburn’s proximity to the Omaha and Lincoln markets offers great opportunities. Visitors, looking for single-day outings to interesting destinations are an im­portant economic opportunity for Auburn. • Strengthen property values. The stabilization and improvement of property values benefits ev­eryone in the city. The buildings in the downtown district account for a significant portion of the city’s overall property valuation. Stabilizing the property values in this district is a benefit to build­ing owners, but also the entire city’s tax base. 2. The historic character of a property will be retained and preserved. The removal of historic materials or alteration of features of features and spaces that characterize a property shall be avoided. 3. Each property will be recognized as a physical record of its time, place, and use. Changes that create a false sense of historical development, such as adding conjectural features or elements from other historic buildings, shall not be undertaken. 6. Deteriorated historic features shall be repaired rather than replaced. Where the severity of deterioration requires replacement of a distinctive feature, the new feature shall match the old in design, color, texture, and other visual qualities and, where possible,materials. Replacement of missing features will be substantiated by documentary, physical, or pictorial evidence. 7. Chemical or physical treatments, such as sandblasting, that cause damage to historic materials shall not be used. The surface cleaning of structures, if appropriate, shall be undertaken using the gentlest means possible. Treatments that cause damage to historic materials shall not be used. 8. Significant archeological resources affected my a project shall be protected and preserved. If such resources must be disturbed, mitigation measures shall be undertaken. When building owners decide to work on their historic commercial building several challenging questions face them. • If the façade is fairly intact but deteriorated, what repairs should be done first? •If significant alternations have been made, should they be kept, should the building be restored to its original appearance, or should another approach be taken? •If the building is no longer in commercial use, can the new use be accommodated while retaining the commercial appearance of the building? •What is an appropriate and acceptable budget for the building owner? One of the biggest questions for building owners when considering work on their building is "where to begin?" This section is designed to provide some general assistance in the process of working on a historic structure. • Evaluate Existing Conditions. The report should inventory the existing condition of the building and relate it back to treatment types. Most importantly it should answer the questions "what needs attention and why". • Work Description. A description of what work would be needed to stabilize the building, meet specific treatment types, and most importantly what will be needed to accomplish the owner’s goals. • Prioritizing Projects. Often a building has more projects than an owner can finance. Understanding the priority of projects can put the investment to best use. Critical projects should be done first with more cosmetic projects waiting until last. Once the building owner decides what projects have to be completed first, a budget should be established. The building assessment and budget could drive the treatment type selected by the owner. Treatment type is very important and should be considered throughout the assessment and budgeting process. The design guidelines outlined in this document are established to assist building owners who bring projects before the Auburn Historic Preservation Board. In addition, the Board can provide important guidance to projects that do not require a Certificate of Approval. By applying the guidelines in this document, the Board and City strive to promote and preserve the historic character of the business districts in Auburn. The longevity and appearance of a masonry wall is dependent upon the size of the individual units and the mortar. Stone is one of the more lasting of masonry building materials and has been used throughout the history of American building construction. The kinds of stone most commonly encountered on historic buildings in the U.S. include various types of sandstone, limestone, marble, granite, slate and fieldstone. Brick varied considerably in size and quality. Before 1870, brick clays were pressed into molds and were often unevenly fired. The quality of brick depended on the type of clay available and the brick-making techniques; by the 1870s--with the perfection of an extrusion process--bricks became more uniform and durable. Terra cotta is also a kiln-dried clay product popular from the late 19th century until the 1930s. The development of the steel-frame office buildings in the early 20th century contributed to the widespread use of architectural terra cotta. Adobe, which consists of sun-dried earthen bricks, was one of the earliest permanent building materials used in the U.S., primarily in the Southwest where it is still popular. Mortar is used to bond together masonry units. Historic mortar was generally quite soft, consisting primarily of lime and sand with other additives. After 1880, portland cement was usually added resulting in a more rigid and non-absorbing mortar. Like historic mortar, early stucco coatings were also heavily lime-based, increasing in hardness with the addition of portland cement in the late 19th century. Concrete has a long history, being variously made of tabby, volcanic ash and, later, of natural hydraulic cements, before the introduction of portland cement in the 1870s. Since then, concrete has also been used in its precast form. While masonry is among the most durable of historic building materials, it is also very susceptible to damage by improper maintenance or repair techniques and harsh or abrasive cleaning methods. 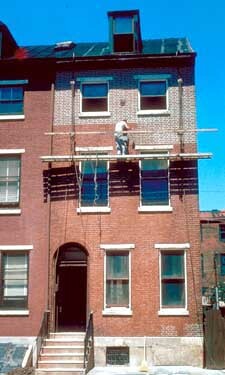 Identifying, retaining, and preserving masonry features that are important in defining the overall historic character of the building such as walls, brackets, railings, cornices, window architraves, door pediments, steps, and columns; and details such as tooling and bonding patterns, coatings, and color. Removing or radically changing masonry features which are important in defining the overall historic character of the building so that, as a result, the character is diminished. Applying paint or other coatings such as stucco to masonry that has been historically unpainted or uncoated to create a new appearance. Protecting and maintaining masonry by providing proper drainage so that water does not stand on flat, horizontal surfaces or accumulate in curved decorative features. Cleaning masonry only when necessary to halt deterioration or remove heavy soiling. Carrying out masonry surface cleaning tests after it has been determined that such cleaning is appropriate. Tests should be observed over a sufficient period of time so that both the immediate and the long range effects are known to enable selection of the gentlest method possible. Cleaning masonry surfaces with the gentlest method possible, such as low pressure water and detergents, using natural bristle brushes. Inspecting painted masonry surfaces to determine whether repainting is necessary. Removing damaged or deteriorated paint only to the next sound layer using the gentlest method possible (e.g., handscraping) prior to repainting. Applying compatible paint coating systems following proper surface preparation. Repainting with colors that are historically appropriate to the building and district. Evaluating the overall condition of the masonry to determine whether more than protection and maintenance are required, that is, if repairs to the masonry features will be necessary. Failing to evaluate and treat the various causes of mortar joint deterioration such as leaking roofs or gutters, differential settlement of the building, capillary action, or extreme weather exposure. Cleaning masonry surfaces when they are not heavily soiled to create a new appearance, thus needlessly introducing chemicals or moisture into historic materials. Cleaning masonry surfaces without testing or without sufficient time for the testing results to be of value. Sandblasting brick or stone surfaces using dry or wet grit or other abrasives. These methods of cleaning permanently erode the surface of the material and accelerate deterioration. Using a cleaning method that involves water or liquid chemical solutions when there is any possibility of freezing temperatures. Cleaning with chemical products that will damage masonry, such as using acid on limestone or marble, or leaving chemicals on masonry surfaces. Applying high pressure water cleaning methods that will damage historic masonry and the mortar joints. Removing paint that is firmly adhering to, and thus protecting, masonry surfaces. Using methods of removing paint which are destructive to masonry, such as sandblasting, application of caustic solutions, or high pressure waterblasting. Failing to follow manufacturers' product and application instructions when repainting masonry. Using new paint colors that are inappropriate to the historic building and district. 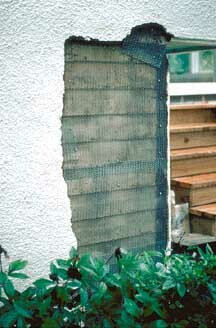 Failing to undertake adequate measures to assure the protection of masonry features. Repairing masonry walls and other masonry features by repointing the mortar joints where there is evidence of deterioration such as disintegrating mortar, cracks in mortar joints, loose bricks, damp walls, or damaged plasterwork. Removing deteriorated mortar by carefully hand-raking the joints to avoid damaging the masonry. Duplicating old mortar in strength, composition, color, and texture. Duplicating old mortar joints in width and in joint profile. Repairing stucco by removing the damaged material and patching with new that duplicates the old in strength, composition, color, and texture. Using mud plaster as a surface coating over unfired, unstabilized adobe because the mud plaster will bond to the adobe. Cutting damaged concrete back to remove the source of deterioration (often corrosion on metal reinforcement bars). The new patch must be applied carefully so it will bond satisfactorily with, and match, the historic concrete. Replacement stones tooled to match original. Repairing masonry features by patching, piecing-in, or consolidating the masonry using recognized preservation methods. Repair may also include the limited replacement in kind--or with compatible substitute material--of those extensively deteriorated or missing parts of masonry features when there are surviving prototypes such as terra-cotta brackets or stone balusters. Applying new or non-historic surface treatments such as water-repellent coatings to masonry only after repointing and only if masonry repairs have failed to arrest water penetration problems. Removing nondeteriorated mortar from sound joints, then repointing the entire building to achieve a uniform appearance. Loss of the historic character due to insensitive repointing. Using electric saws and hammers rather than hand tools to remove deteriorated mortar from joints prior to repointing. Repointing with mortar of high portland cement content (unless it is the content of the historic mortar). This can often create a bond that is stronger than the historic material and can cause damage as a result of the differing coefficient of expansion and the differing porosity of the material and the mortar. Repointing with a synthetic caulking compound. Using a "scrub" coating technique to repoint instead of traditional repointing methods. Changing the width or joint profile when repointing. Removing sound stucco; or repairing with new stucco that is stronger than he historic material or does not convey the same visual appearance. Applying cement stucco to unfired, unstabilized adobe. Because the cement stucco will not bond properly, moisture can become entrapped between materials, resulting in accelerated deterioration of the adobe. Patching concrete without removing the source of deterioration. Replacing an entire masonry feature such as a cornice or balustrade when repair of the masonry and limited replacement of deteriorated of missing parts are appropriate. Using a substitute material for the replacement part that does not convey the visual appearance of the surviving parts of the masonry feature or that is physically or chemically incompatible. Applying waterproof, water repellent, or non-historic coatings such as stucco to masonry as a substitute for repointing and masonry repairs. Coatings are frequently unnecessary, expensive, and may change the appearance of historic masonry as well as accelerate its deterioration. Replacing in kind an entire masonry feature that is too deteriorated to repair--if the overall form and detailing are still evident--using the physical evidence as a model to reproduce the feature. Examples can include large sections of a wall, a cornice, balustrade, column, or stairway. If using the same kind of material is not technically or economically feasible, then a compatible substitute material may be considered.